Art in the Garden or Garden in the Art? | Faddegon's Nursery, Inc.
Art in the Garden or Garden in the Art? May 10, 2016 | Shrubs, Trees & Vines, What's New? Do you recognize this painting? It’s likely that you’ve seen A Sunday Afternoon on the Isle of La Grande Jatte by George Seurat, the Parisian post-impressionist painter. Seurat is known for his method of painting called pointillism; capturing a scene by painting tiny dots of color to create the whole image.Since I am a fan of Seurat, I was fascinated and amused when I came across a picture of The Topiary Park in Columbus, Ohio. Artists are often inspired by nature, whether the work is representational or not. We see landscapes painted and photographed all the time. However, this topiary park shows how one artist’s vision turned the tables on this idea with a lot of yews and some very interesting results! I’ll let the artist himself explain what I mean. 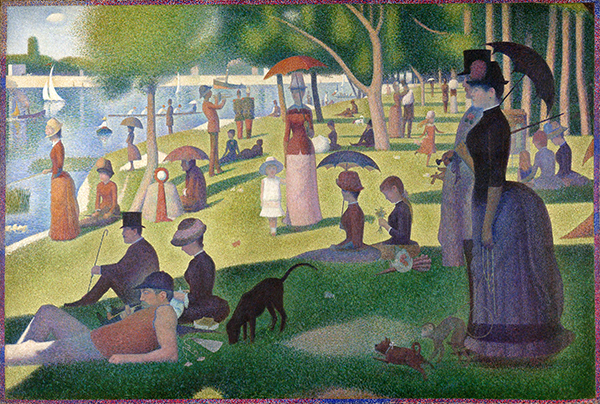 I think it would be amazing to see this park on a day with bright summer sunlight as in the painting. There is also a spot to stand on which allows you to see the entire “painting” composed as in the original!